MONTREAL, QUEBEC--(Marketwired - June 16, 2015) - Amex Exploration Inc. (TSX VENTURE:AMX) ("Amex" or the "Corporation") is very pleased to announce that Agnico Eagle Mines Ltd (TSX:AEM)(NYSE:AEM) has presented the results of its 2015 winter drilling work program on Amex's Perron property. This program is under the terms and conditions of the second year of the Perron option agreement that was signed in 2013 (see PR of June 21, 2013 for details on the option agreement terms and conditions). The three different objectives of this phase of drilling returned positive results (see below and Table 1), but the highlight of this work is the discovery of a new unknown polymetallic mineralization that returned 2.23 % Cu, 0.11% Zn, 8.30 g/t Ag and 0.20 g/t Au over 1.0 meter within the Normetal Mine Horizon (NMH). This mineralization is hosted within a highly chloritized stratabound unit of tuffeceous material located between a unit of rhyolite and a unit of andesite of the NMH at the same stratigraphic position of the former producer Normetal Mine (historical lifetime production of 10.1 MT @ 2.15% Cu, 5.12% Zn, 0.55 g/t Au and 45.25 g/t Ag) situated at less than 3 km to the East of the property. As a whole, this latest phase of work consisted of 13 drill holes totalling 4,846 meters of drilling that has been executed with two diamond drill rigs between January and April 2015. Three distinct types of targets were identified with this work based on the previous phases of drilling and last year's airborne geophysical survey that covered the entire Perron property (see PR 2015-01-19). First, in the vicinity of Amex initial discovery hole PE-2013-03 drilled by Amex in 2013, and a follow up of new polymetallic gold-bearing structure in hole #163-14-004 that has been identified in 2014 drilling (see PR of January 8th, 2015). Second, to test the lateral potential contact between the Rhyolite unit and the Andesite unit of the Beaupre bloc, host of the known Perron polymetallic mineralization, on a large spacing grid. Third, on new airborne geophysical anomalies identified last year that have never been drilled before and that are located within the Normetal Mine Horizon. This specific geological unit, located at some 0.5 km to 1.0 km to the North of the Rhyolite-Andesite contact of the Beaupre Bloc, can be followed over a strike length of 8 km within the Perron Property. This unit, which has never been drilled previously by Amex, is the host of several polymetallic VMS deposit including the former Normetal Mine. Overall, three drill holes were drilled in the vicinity of the initial Perron Polymetallic Mineralization (Target 1; namely holes 163-15-008, 012 and 020), five following the favourable Rhyolite-Andesite contact of the Beaupré bloc (Target 2 ; from West to East; holes 163-15-017, 018, 021, 013and 011) and finally five holes on the Normetal Mine Horizon (Target 3; from East to West; holes 163-15-009, 010, 015, 019 and 014). (see figure 1 for location and Table 1 for results). Table 1: Geochemical analysis was executed by ALS Chemex Laboratories in Val D'Or under Agnico Eagle Mines QA/QC program and supervision. Two out of three holes (i.e. 163-15-012 and 020) were drilled perpendicular to the discovery hole PE-2013-03 in order to better understand the geometry and the continuity of the now interpreted as a typical polymetallic VMS stockwerk zone made of veins and veinlets of almost semi-massive sulfides (mostly sphalerite, chalcopyrite and pyrite/pyrrhotite) associated with highly altered rhyolite with a significant content of Manganese-bearing porphyroblasts of garnets. 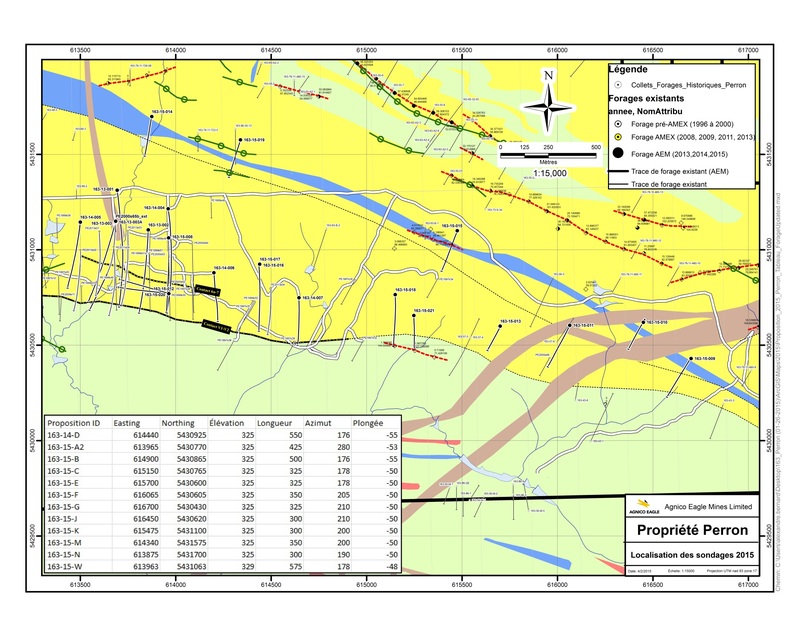 The two holes intersected the overall stockwork structure at different locations and depths, but with expected narrower intervals with values of up to 2.70 g/t Au, 18.95 g/t Ag, 1.38% Zn and 0.07% Cu over 3.9 meters including 0.5 meter at 13.25 g/t Au, 99.60 g/t Ag, 4.22% Zn and 0.12% Cu in hole 163-15-012 and 1.79 g/t Au, 7.84 g/t Ag, 0.17% Zn and 0.10% Cu over 12.0 meters including 0.8 meter at 15.80 g/t Au, 17.30 g/t Ag 0.16% Zn and 0.05% Cu and including 0.5 meter at 2.04 g/t Au, 121.00 g/t Ag, 0.38% Zn and 2.01% Cu in hole 163-15-020. These results indicate that this mineralized structure can be followed over an area of a minimum lateral extent of 50 meters by a vertical extent of at least 100 meters and still open in all directions. The third hole in this area (ie hole 163-15-008) was drilled to test a second mineralized structure similar to the first one outlined in the former drill program done last year but located at some 300 meters to the east (ie hole 163-14-004), but closer to the surface. Only wide spread gold and zinc anomalies were intersected (see Table 1). In total, 5 holes have been drilled to test the Rhyolite-Andesite favourable contact within the Beaupré bloc (host of the Perron Polymetallic Mineralization) at the eastern portion of this horizon over a distance of about 4,0 km. These 5 DDH were drilled at a spacing of about 250 meters along a strike length of about 1.5 km starting with hole 163-15-017 located at a distance of about 75 meters to the west of hole PE-2013-04 and ending with hole 163-15-011 located at 2.5 km of the same hole. Except for hole 163-15-021, all of these holes returned some anomalous polymetallic gold zones associated with the same alteration type that for the Perron Polymetallic structure, characterized by the presence of pinkish porphyroblasts of garnet, with values of up to 11.8 g/t Au and 1.50 g/t Ag over 0.5 meters in hole 163-15-017 where some visible gold was also noted. In the case of hole 163-15-021, a highly pyritized stratabound mineralization associated with high silica and sericite alteration that is totally different of the Perron polymetallic mineralization has been intersected close to the Rhyolite-Andesite contact of the Beaupré Bloc. This intersect has returned 1.70 g/t Au over 5.5 meters including 0.8 meter at 9.45 g/t Au. It is important to note that this intersect seems to be associated with a VTEM airborne geophysics that is parallel to the mineralization and can be followed over a strike length of at least 400 meters. Following the 2014 VTEM airborne survey and a geological compilation work of the property, five holes were drilled in order to test the Normetal Mine Horizon. From this work, one drill hole (ie 163-15-015) has intersected a significant semi-massive sulfide horizon associated with heavy dark chlorite alteration that returned 2.23 % Cu, 0.11% Zn, 8.30 g/t Ag and 0.20 g/t Au over 1.0 meter. This mineralization is hosted within a stratabound unit of tuffeceous material located between a unit of rhyolite and a unit of andesite of the NMH at the same stratigraphic position of the former producer Normetal Mine (historical lifetime production of 10.1 MT @ 2.15% Cu, 5.12% Zn, 0.55 g/t Au and 45.25 g/t Ag). Moreover, this intersect is associated with a VTEM anomaly identified last year by airborne survey over more than 300 meters in strike length. Down hole geophysics survey (Pulse EM) in this hole has detected an EM conductor associated directly to this intercept that confirmed the airborne anomaly and open up new promising ground for additional work. The management of Amex is very enthusiastic about the results of this latest phase of drilling done by Agnico Eagle Mines on Amex's 100% owned Perron property. Jacques Trottier, Ph.D, president and CEO of Amex says: 'This less than 5,000 meters phase of drilling has, in our opinion, successfully returned positive results on each of three different types of target. Namely, not only on follow-up drilling in the Amex 2013 discovery area, but also on two very different types of target. This shows how much this underexplored property potential has. I want to personally congratulate the Agnico Eagle Mines exploration team for this new discovery on the Normetal Mine Horizon done by their skilled experienced exploration geologists. We are looking forward to see the follow-up program on each of the favourable targets that they have outlined, hopefully in a very near future'. Amex Exploration Inc. is a junior mining exploration company listed on the TSX Venture Exchange whose primary objective is to develop and bring into production viable gold and base metal deposits. Jacques Marchand, P.Eng. Geo., Qualified Person as defined by Canadian N43-101 has approved the technical information reported in this news release.